Ever want to blow up your friends? Learn how to make a game like a Bomberman with Unity 3D in this step by step tutorial that will have you setting bombs off with ease. Update note: This tutorial has been updated to Unity 2017.1 by Brian Broom. The original tutorial was written by Eric Van de Kerckhove. Unfortunately, it’s a little difficult to secure C4 explosives along with some willing buddies willing to explore the afterlife. Thankfully, there are some alternatives. Enter this Bomberman tutorial. 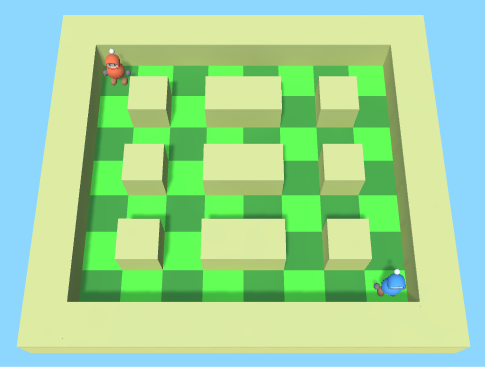 Bomberman is a game where four players battle it out by strategically placing bombs across the battlefield with the goal being to blow each other up. Each bomb has a few seconds of delay before it explodes and spews out an inferno in four directions. For additional excitement, explosions can trigger impressive chain reactions. The original Bomberman came out in the early 80s and spinoffs have been published ever since. It’s a timeless game formula that’s still a lot of fun to play and build. The original title was 2D, but you’re going to create a basic 3D version inside of Unity. Dropping bombs and snapping them to a tile position. Spawning explosions by using raycasts to check for free tiles. Handling explosions colliding with the player. Handling explosions colliding with bombs. Handling player death(s) to determine a win/draw. Note: This Bomberman tutorial assumes you know your way around the Unity editor and know how to edit code in a text editor. Check out some of our other Unity tutorials first if you’re not confident yet. Download the Starter Project for this Bomberman tutorial and extract it to a location of your choosing. Physics Materials: Holds the physics material of the players — these are special kinds of materials that add physical properties to surfaces. For this tutorial it’s used to allow the players to move effortlessly arund the level without friction. If it’s not opened yet, open up the Game scene and give it a run. Both players can walk around the map using either the WASD keys and the arrow keys. 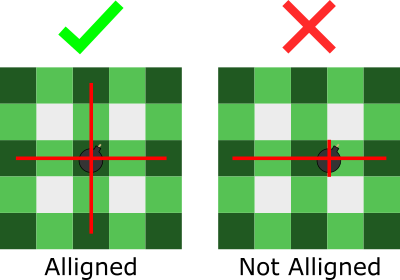 Normally, when player 1 (the red one) presses Space he should place a bomb at his feet, player 2 should be able to do the same thing by pressing Enter/Return. However, that doesn’t work yet. You need to implement the code for placing bombs first, so open the Player.cs script in your favorite code editor. There’s a small problem with the way the bombs get dropped though, you can drop them wherever you want and this will create some problems when you need to calculate where the explosions should spawn. You’ll learn the specifics of why this is important when this tutorial covers how to make the explosions. The next task it to make sure the bombs snap into position when dropped so they align nicely with the grid on the floor. Each tile on this grid is 1×1, so it’s fairly easy to make this change. Select the Scripts folder in the Project view. Name the newly created script Bomb. 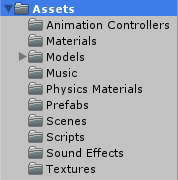 In the Prefabs folder, select the Bomb GameObject. In the Inspector window click the Add Component button. Type bomb in the search box. Select the Bomb script you just made. Invoke() takes 2 parameters, firstly the name of the method you want to be called and secondly, the delay before it gets called. In this case, you want to make the bomb explode in three seconds, so you call Explode() — you’ll add it next. Once you’ve done this, return to the code editor. You finally get to write the code that makes things go boom! Spawns an explosion at the bomb’s position. Disables the mesh renderer, making the bomb invisible. Disables the collider, allowing players to move through and walk into an explosion. 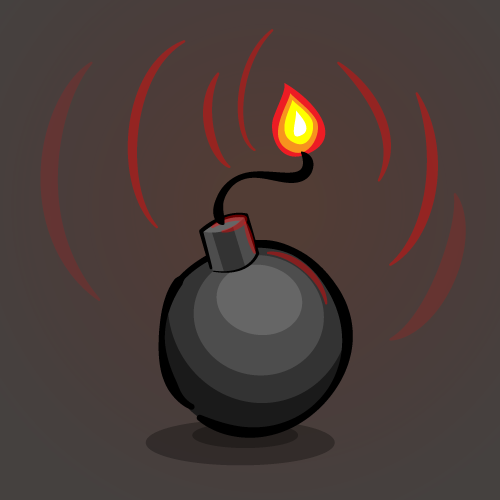 Destroys the bomb after 0.3 seconds; this ensures all explosions will spawn before the GameObject is destroyed. Save your Bomb script and return to the editor and give your game a play. Put down down some bombs and bask in the fiery goodness as they explode! Cool guys don’t look at explosions! A LayerMask selectively filters out certain layers and is commonly used with raycasts. In this case, you need to filter out only the blocks so the ray doesn’t hit anything else. If necessary click on the expansion triangle in front of the word Layers to expand the list of layers if it is not visible. 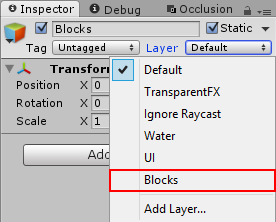 Click the text field next to User Layer 8 and type in “Blocks“. This defines a new layer you can use. Inside the hierarchy view, select the Blocks GameObject, inside the Map container object. When the Change Layer dialog comes up, click the “Yes, change children” button, to apply to all of the yellow blocks scattered across the map. Finally add a public reference to a LayerMask so the Bomb script will be able to access the layer by adding the following line just below the reference to the explosionPrefab. Don’t forget to save your code. Bigger! The Explosions Must be Bigger! The next step is to add the iconic touch of expanding rows of explosions. To do that, you’ll need to create a coroutine. Note: A coroutine is essentially a function that allows you to pause execution and return control to Unity. At a later point, execution of that function will resume from where it last left off. People often confuse coroutines with multi-threading. They are not the same: Coroutines run in the same thread and they resume at intermediate points in time. To learn more about coroutines and how to define them, check out the Unity documentation. The StartCoroutine calls will start up the CreateExplosions IEnumerator once for every direction. Iterates a for loop for every unit of distance you want the explosions to cover. In this case, the explosion will reach two meters. A RaycastHit object holds all the information about what and at which position the Raycast hits -- or doesn't hit. This important line of code sends out a raycast from the center of the bomb towards the direction you passed through the StartCoroutine call. It then outputs the result to the RaycastHit object. The i parameter dictates the distance the ray should travel. Finally, it uses a LayerMask named levelMask to make sure the ray only checks for blocks in the level and ignores the player and other colliders. If the raycast doesn't hit anything then it's a free tile. Spawns an explosion at the position the raycast checked. The raycast hits a block. Once the raycast hits a block, it breaks out of the for loop. This ensures the explosion can't jump over walls. Waits for 0.05 seconds before doing the next iteration of the for loop. This makes the explosion more convincing by making it look like it's expanding outwards. The red line is the raycast. It checks the tiles around the bomb for a free space, and if it finds one then it spawns an explosion. When it hits a block, it doesn't spawn anything and it stops checking in that direction. 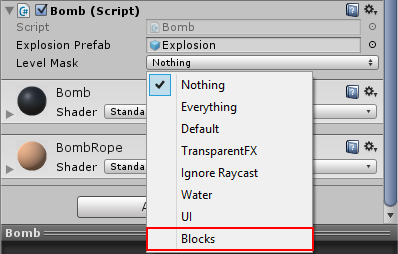 Finally, select the Bomb prefab in the Prefabs folder in the project view, and change the Level Mask to Blocks. Congratulations, you've just made it through the hardest part of this tutorial! Go ahead and reward yourself with a refreshing drink or a delicious snack, think about what you just did, and then come back to play around with reactions to explosions! When an explosion from one bomb touches another, the next bomb should explode -- this feature makes for a more strategic, exciting and firey game. Luckily this is quite easy to implement. OnTriggerEnter is a pre-defined method in a MonoBehaviour that gets called upon collision of a trigger collider and a rigidbody. The Collider parameter, named other, is the collider of the GameObject that entered the trigger. In this case, you need to check the colliding object and make the bomb explode when it is an explosion. Checks the the bomb hasn't exploded. Checks if the trigger collider has the Explosion tag assigned. Cancel the already called Explode invocation by dropping the bomb -- if you don't do this the bomb might explode twice. Now you've got some seriously destructive firepower going on. One little explosion can set your little game world on fire by triggering other bombs, allowing for these cool chain reactions! The last thing to do is to handle players' reactions to explosions (Hint: they're not good!) and how the game translates the reaction into a win or draw state. Open the Player.cs script in your code editor. This variable is used to keep track if the player died to an explosion. This is a reference to the GlobalStateManager, a script that is notified of all player deaths and determines which player won. Inside OnTriggerEnter(), there's already a check to see if the player was hit by an explosion, but all it does right now is log it in the console window. Sets the dead variable so you can keep track of the player's death. Notifies the global state manager that the player died. In the hierarchy window, select both Player GameObjects. Drag the Global State Manager GameObject into their Global Manager slots. Run the scene again and make sure one of the players is obliterated by an explosion. Every player that gets in the way of an explosion dies instantly. The game doesn't know who won though because the GlobalStateManager doesn't use the information it received yet. Time to change that. Open up GlobalStateManager.cs in your code editor. First off, deadPlayers will hold the amount of players that died. The deadPlayerNumber is set once the first player dies, and it indicates which one it was. It sets the dead player number to the player that died first. Checks if the other player also died or if just one bit the dust after 0.3 seconds. That last delay is crucial for allowing a draw check. If you checked right away, you might not see that everybody died. 0.3 seconds is sufficient to determine if everybody died. You've made it to the very last section! Here you create the logic behind choosing between a win or a draw! A single player died and he's the loser. Player 1 died so Player 2 is the winner. Player 2 died so Player 1 is the winner. Both players died, so it's a draw. Download the finished Bomberman tutorial Final Project if you got stuck. 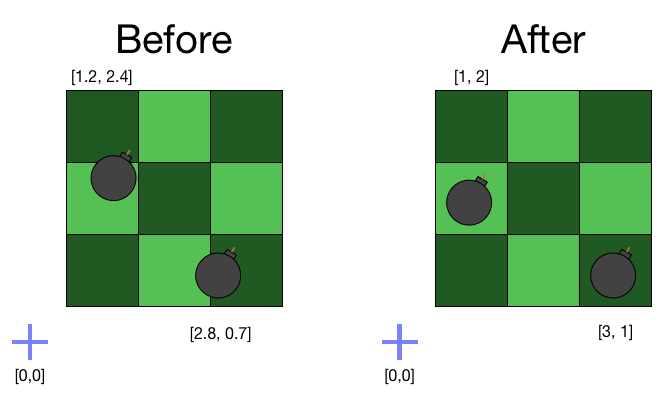 Now you know how to make a basic Bomberman-like game by using Unity. This Bomberman tutorial used some particle systems for the bomb and the explosion, if you want to learn more about particle systems, check out my Introduction To Unity: Particle Systems Tutorial. Be sure to share your creations here, I'd love to see what you guys can come up with! As always, I hope you enjoyed this tutorial! If you have any remarks or questions, you can do so in the Comments section.